This blog has been in something of a hiatus. But I’ve decided that I do need somewhere to leave notes and HOWTOs and so on. Many people are retweeting and liking the Frankie Boyle piece on causing offence and free speech (and it is worth reading), basically arguing that we should just get over ourselves and have our own ideas rather than being spoon-fed by the entrenched media interests. If Peter Oborne’s resignation from the Telegraph tells us anything that we didn’t know about journalism and the mainstream news media, it’s that any news source should be read with the thought “why are they telling me this now?” rather than “oh, how terrible about “. Meanwhile, I’ve finally got around to reading this article about why we’ve pretty much just stalled on technology, innovation, even politics, when compared to the 25 years after WW2. The author here is suggesting that we’re just coasting on minor incremental improvements, rather than generating genuine disruptions to the status quo. It seems to me that the two perspectives are just two sides of the same coin – that we’ve got to a point that we’re just navel gazing and skipping from one release of a gizmo to the next, trying to find things to be angry about apart from the major issues that we just ignore because our minds can’t deal with them. “Go back to bed America, here’s 56 channels of American Gladiators.” – Bill Hicks. We should be able to solve cancer, climate change, transport, power consumption, but we’re too busy playing candy crush and trying to be nice to everyone. That some of the best commentary about global affairs in 2015 can be summarised by rehashing comedy routines from writers who’ve been dead for decades is not ironic in the slightest. Maybe we do just need another good global conflict to kickstart some real conversations and progress and, thanks to the party boys in the Kremlin, we might just be on our way. Another day, news of another fatality, the fifth in just nine days and another at Aldgate, on or near CS2. I’m genuinely speechless about this. I’m upset. I’m angry. I’m frustrated. It doesn’t have to be like this, but the hollow promises of the ‘Go Dutch’ and similar campaigns cannot be allowed to continue. For years I’ve laughed off talk from friends and family of the dangers of cycling; I’ve always thought of myself as road aware, decently savvy on the streets, that the thousands of miles I do annually, the tens of thousands of miles I’ve cycled on London’s roads over the last couple of decades have given me a few extra senses. To a significant extent, that’s true. I’ve had many close calls but very few collisions, the last time I had unintended physical contact while riding – with the road or another vehicle – was several years ago and even that was a minicab running a red light, so I’m especially conscious of those complaining about the ubiquitous red-light-jumping cyclist. We can generally ignore the inane witterings of Rod Liddle, most reasonable thinking people see cycle commuting in London for what it is – just ordinary people trying to get to work. The roads might not have been built for cars in the beginning, but they have certainly been redesigned for them in recent decades. Our 21st century road system is increasingly unfit for its cycling purpose. There are junctions in London right now, like Blackfriars Bridge, where the majority of rush-hour traffic are bikes. Why are HGVs even allowed there at the same time? We need segregation at major junctions, not being asked to dodge 3 lanes of motorised traffic so we can turn right, not having to share what provisions we do have with illegal motorbikes. 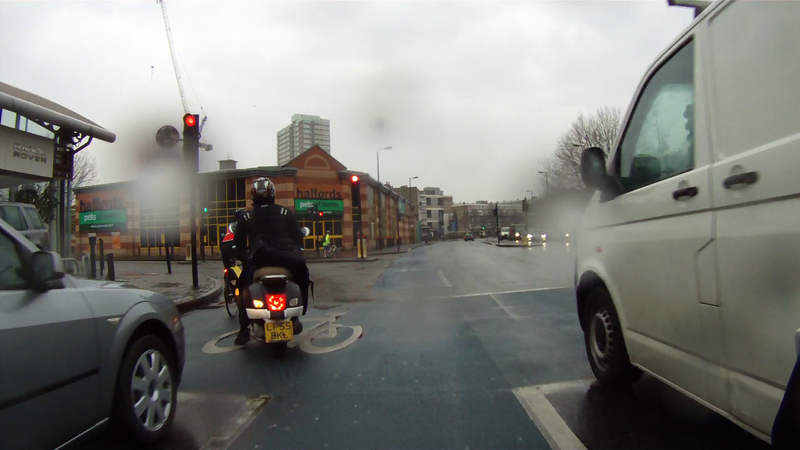 I’m sure the HGV drivers don’t like the bikes swarming around where they can’t see them, either. I’m off to make another donation to RoadPeace and to apparently count myself lucky that I made it to work in one piece again. If five pedestrians had been killed in the last nine days there’d be questions in parliament and front page headlines, special programmes on the TV. But because it’s the roads, the carnage out there is just something we’re expected to tolerate and put up with. This isn’t about red light jumping, whether to wear helmets and hi-viz jackets, or some smug sense of middle aged lycra clad entitlement. This is just about making London – and the UK – more pleasant places to exist. A city choked by motor vehicles where the inhabitants travel around feeling physically intimidated and consistently let down by the elected (and unelected) powers that be. Cyclists deserve better. London deserves better. We all deserve better. [we] need to keep tipper trucks and people on bikes apart from each other. It’s more than just tipper trucks, though. Look at this footage and count the number of tourist buses, in the rush hour, in a bus lane, on top of the cycle lane, with no one on board. This, to me, does not mean safe. This is not a stretch of road I want my kids cycling down on their way to school. After yesterday’s news of Margaret Thatcher’s death and the inevitable programmes and news articles reminiscing about her time in office and the conditions in the UK that led to her election in 1979, it occurred to me on my ride into work this morning that there are still places where the 1970s exists. I don’t mean avocado bathroom suites, orange juice as a starter, kipper ties, the Bay City Rollers and the trades unions dictating the political agenda but in the casual way discrimination was so much a part of every day life that most people didn’t even notice it. Be it racism, sexism, he’s-not-from-around-here or just not trusting any Irish voice, there were countless ways that not being a white man born within a few miles of the spot you were standing really did impact on your existence because you were different and that matters. We still see that on our roads on a daily basis. The casual way cars turn left across bikes with barely a glance. The way motorbikes fill the Advanced Stop Zones with many of them not even aware that they’re committing an offence (or, more likely, they know they are, yet are doing it anyway). The relaxed attitude with which lorry owners treat the safety of other road users. The unfathomable leniency that the law extends to drivers who kill and maim, in spite of the rules which they’ve transgressed. The canards from white van man about paying road tax. I’m struck with the parallels to Apartheid in South Africa: the natives (cyclists) were suddenly invaded by outsiders (vehicles), who rapidly decided to make rules that were previously unnecessary (e.g. traffic lights, one-way streets), quickly deciding that the best land should be solely theirs (explicitly with dual carriageways, implicitly with many town centres) consigning the original inhabitants to shanty towns and the worse land (circuitous ‘cycle routes’, crap cycle facilities and acres of ‘cyclist dismount’ signs), meeting resistance with officially sanctioned violence (for all the deaths on the roads, very few result in genuine punishments). In yesteryear, we knew that the South African way was wrong, but the politics of those times took a very long time to catch up with popular opinion. But times have changed in southern Africa and times are changing on our roads. Jack Thurston, the host, gets the wider meaning of cycling, but he also gets people to talk in meaningful ways – and his interview with Cynthia Barlow and Bill Chidgey was another example. Both long term campaigners, the former lost her daughter to a lorry and the latter was a cycle courier who has seen too many colleagues die on London’s roads. Please, go listen to the episode, (and then go donate to Roadpeace) but I was struck in particular by the point made about the Health and Safety Executive. Lorries, in particular around construction sites, are subject to many rules and safety requirements when on site. But as soon as they’re off site, bang, normal laws apply and suddenly the rest of the users of the road are open season. Our roads are not fit for purpose, our 21st Century discrimination should not be allowed to continue. It’s a normal morning, the traffic is reasonable, the roads are a little damp, but what wind there is is, gratifyingly, mainly a tail. So far, so typical. I’m ticking along the Embankment just along from the Chelsea Physic Garden. There’s a car next to me who I’ve been tracking for about half a mile and a lorry just in front of us. I’m being cautious with the lorry but the traffic is slowing ahead because of the lights on the south end of Chelsea Bridge, so I do go up his nearside. The visibility is good, he’s not obviously making any leftward intentions and I’m mindful that while this isn’t always advisable, I’m carrying enough speed that I’ll only be beside him for a couple of seconds and there seems to be plenty of space. So now I’m in front of him and, as there often is, there’s a police check of some description in the lay-by behind the Royal Hospital. So there’s a copper who has decided that the lorry behind me is to be pulled over. Pop-quiz, what does he do? Yes, children, he walks straight out into the road in front of me. Now, we all know that’s dangerous, don’t we? A policeman doing his job. But doing it in the road. My road. Nice work fella. I’m doing 35kph+, it’s reasonably light by now and I’m well lit; there is no excuse. You give me about 18 inches of gap, but you are still moving out and you’re not even looking at me. You give me no indication that you are treating me safely, you’re waving at the lorry and moving to intercept him, through me. 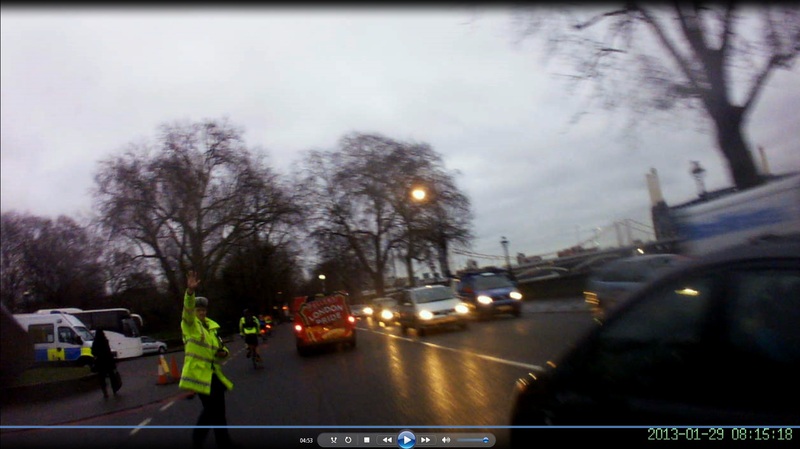 You’ve got a job to do, but that is a classic example of what cyclists have to put up with. This traffic cop has no empathy with my situation; most drivers don’t. That road is a busy cycle route into town and, at that time of the morning, is chock full of both cyclists and vehicles. Not that this copper apparently understands that. That’s head-racing, rowing’s an outdoor sport. Apologies if that seem blasé, it certainly is not meant to be. I’ve been responsible for compiling the results for the Scullers Head for about 10 years and within that time I’ve seen wildly different conditions, seen many problems and heard many complaints. After every race we receive more or less civil questions about the results we publish and 2012 has been no different; many people, especially this year, are basically wondering why were we not better at predicting the conditions in advance and how come we didn’t we make the Tideway fairer for all competitors. As organisers we measure the success of the race on more dimensions than coaches and athletes. Did we get enough entrants? Did we get enough officials? Will the weather make it unsafe? Did we get enough decent data from the two ends to be able to compile the results? Did we have to do too much problem solving in producing the results? Have we identified all the crews without bow numbers? Are there any category winners with penalties? Have we switched the lightweights who didn’t weigh in? Have we excluded any entries racing for a time only? Do the results look both reasonable and accurate? It must be said that at every stage in every race almost every one of those questions (and a hundred others) causes momentary panic (and sometimes a lot longer than just a moment). For me, while compiling the results, the first cut of the results (which was very similar to the provisional set published, which was the set finalised) just looked awful. Far too many high start numbers (450+) having done far too well. We expect some high numbered new entrants to finish well, but these would generally be those around 110, the elite new entrants. Firstly, Alan Campbell had won, so we knew that there wasn’t too much wrong, but when 4 of the top 6 finishers are novices, something is least awry. My first reaction is that it is my results – what is wrong with the data? Very quickly though, after validating sample after sample, we realised that our data were credible and it was something else. While many 450+ entrants had done well, they hadn’t all done well, there were breaks. Experienced watchers saw the results and nodded knowingly, the high fliers might have flown higher thanks to the conditions, but they were always going to have done well. Many people before and during the race highlighted the issue of landwater and I’ve seen various calculations as to the effect this would have had at various stages in the race. It obviously made a difference. This year it was landwater, some years it is rain, others wind. The issue of stream strength is a perennial classic and, frankly, one we can do nothing about. The time from the first sculler crossing the start line to the last sculler crossing the finish was a smidge under 2h15 (overall the scullers started at 4.2 scullers per minute, which is within the normal range, the top 100 started slightly faster at 4.9 per minute which again is to be expected). There are a couple of breaks baked into the start, to allow natural gaps to make it easier for returning scullers to cross (otherwise Hammersmith/Barnes Bridge scullers will find it close to impossible to get across the river and home before the last sculler passes), but this has only a small effect on the overall time taken. Switching the oldest entrants to the middle does make a slight difference too, comparing the times taken by the W.IM3.LWT compared to MasI. We started approximately an hour after Chiswick high tide – this is normal. If you compare the start times of similar races, you’ll find that compared to this year’s 4s head we were comparitively about 20 minutes earlier, and for next year’s men’s head less than 20 minutes. The women’s head in 2013 will be slightly later, about 45 minutes, but there are no huge outliers. Had we started at 1000 or 1030 there would still have been a marked difference in flow rates, but crucially we start at that time for a reason. On a typical day, if we start much later, we run out of water under Putney Pier so returning crews have to go around the outside and this makes marshalling (and timing) more problematic. We have 550 boats in the draw and while we expect 15% or so not to start, we still had 446 finishers and we need that extra time which the Women’s Head in particular don’t need – they finished with 287 boats this year, that would have made 45 minute’s difference in the arrival of the last boat across the finish line. I’m not moaning about the comments, every has a right to make comments, but there is often more to it than you realise.